For the past few months, I have been reading through the book of Psalms. There are so many heartfelt and honest emotions captured in the chapters of this book. More than half of the Psalms were written by David, who was not afraid to pour out his heart to the Lord. I think that David's passion for the Lord is why he is called a man after God's own heart. God has a passionate love for us and wants us to love Him with the same fullness that He loves us. 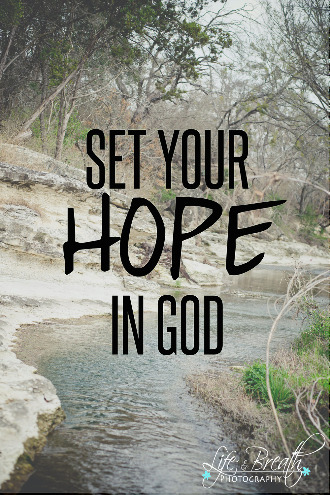 One key theme that emerges from Psalms is to set our hope in God. No matter what threatens us - from outward forces or inward emotions, God is our stronghold, our fortress and rock. (Psalm 18). Life is hard: no matter how much money you have, no matter how many things you own, no matter how big or small your family is - everybody feels as if their fight is bigger than everyone else. And the Bible is filled with stories of people who struggled yet learned to set their hope in God. David was chosen to be king but he waited years before that happened, during which he was hunted, forced to hide in caves, and even cursed and pelted with stones by a man while he traveled. Yet he never wavered in his belief that God would fulfill all his promises. Paul was beaten, stoned, left for dead, imprisoned for long periods of time and even at one point, despaired for his life, but he set his hope in God, knowing that all of it was worth the price of knowing Jesus. And in Hebrews it says that Jesus endured the cross and suffered the shame for the joy set before him (12:1). The joy was knowledge of the salvation his sacrifice would give us and the hope that we would have for our future. In my own life, I have had to deal with the real possibility that my son Cole might die. He was born with a heart condition that has resulted in many surgeries including the implantation of a pacemaker. We have been dealing with this since he was born and thankfully his prognosis is so much better than it was when he was younger. We didn't know what might happen to him as he grew or if his heart would worsen more than they expected. So, I had to accept that he might die. I prayed, I read scripture and ultimately, I came to the realization that if he did die, he would go to heaven and be in the presence of Jesus. And while I would grieve my loss, I would be able to cling to the hope that I would see him again someday. There have been many times when I have questioned why we have had to go through all of this, yet I know that it has served to strengthen our faith and give us opportunity to give God the glory for what He has done. And now my son Cole is doing really well and all of it is because of God's grace and power to heal. Whatever you are going through, God wants you to turn to him. He is already in your life wanting to know you and carry your burdens. He wants you to know that He loves you and wants the best for you. It may be hard to believe that in the midst of a difficult time, but if you set your hope in God, you can trust that all of these struggles are for but a short while.